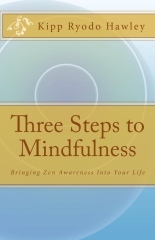 What can we do to arrive at mindfulness? How do you get somewhere when you’re already there? In ancient China, Joshu asked Zen Master Nansen, “How can we find The Way?” Nansen replied, “If you try to turn toward it, you go away from it.” If you’re already in East Vassalboro, going in any direction is wrong. The Way, the Tao, is everywhere, every moment – exactly where you are right now, so anything special you do to create it or find it simply takes you away from it. Zen Mindfulness is about connecting with The Way and living in moment-by-moment awareness of it. So, how will you arrive at mindfulness? The sky is blue. A flock of birds flies through, and the blue sky effortlessly allows them passage. The sky supports those birds, clouds, the sun, moon and stars. No effort! What is it within you that has that quality? What is it that is completely open and inclusive of all your thoughts, dreams and feelings, supporting them all equally, with no effort? Spend ten minutes doing the Zen Mindfulness labeling practice. First, take a deep breath and let it out in a long sigh. Now, for the next ten minutes, give a little label to each thing that comes into your field of awareness. No matter what it is, be clearly aware of it, mentally give it a short label, then let it go. Sounds, thoughts, sensations, feelings, everything. Your stream of labels might go something like this: “itchy foot … car outside … music in my head … worries about work … air conditioner … sunlight on floor … breathing … birdsong …” Just a little label for everything you are aware of, one after the other. After ten minutes, how are things for you?